The Edge Protector Making Plant is made heavy duty to produce high strength paper edge protectors and U Profile and C Profile channels which are very ideal to prevent damages to edges of various palletized goods and circular goods like paper reels, steel coils etc. The machine is rugged, yet easy to use. It has facility to interchange profile design and variable speed drive for faster setting and control of process wastage. The future of packaging lies in the recyclability of most of the packaging materials. Edge protector is an environment-friendly product using strong paper board which is easily recycled. We are one of the trusted names in the market to offer a highly durable range of Edge Board Rotary Notching Machine. The offered edge board rotary notching machine is sturdy in construction and are technically advanced. To maintain industry defined quality parameters, these edge board rotary notching machines are manufactured from quality proven components and cutting-edge technology. We ensure to deliver fully tested edge board rotary notching machines at leading market price within the promised time frame. Being a customer oriented organization we are engaged in offering a quality approved range of Paper Angle Boards that is used in conjunction with strapping or stretch film, helps create a tight, secure shipping cube to contain your load prevent damage from shifting. Offered angle boards are quality assured and known for their optimum performance. Our clients recommended these angle boards for their easy usage and less maintenance. The offered range of angle boards is made under the supervision of highly skilled professionals as per the set industrial parameters. These angle boards can be availed at best market price. It is ideal for use with stretch wrap systems, giving tighter wraps with no carton collapse, and less risk of film puncture at corners. 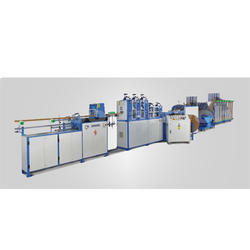 Looking for Edge Protector Making Machinery ?